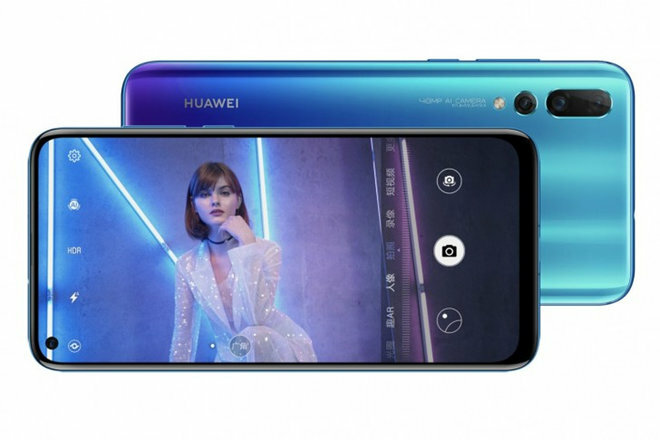 The Huawei Nova 4 has been revealed in China with a 25 megapixel pinhole camera punched into the top corner of the full-front display just like the Samsung Galaxy A8s. We’re expecting to see an increasing number of pinhole camera setups as we move into 2019 – it may well be the new version of 2018’s notch culture (or is it the slider?). With the Nova though, it isn’t even the front camera that’s most noteworthy. Instead, it’s the main rear camera, which is a hefty 48 megapixel unit (providing you get the slightly more expensive model) alongside a 16 megapixel f/2.2 ultra wide-angle camera and a depth sensor. Indeed, as you can see below, the rear arrangement is reminiscent of the not-that-old Huawei P20 Pro and the similarities with that handset don’t end there – it’s best to think of the Nova 4 as a slightly cheaper version of the P20 Pro. The device is based around the same Kirin 970 platform as the P20 and P20 Pro (the Mate 20 series uses the newer Kirin 980). There’s also Android 9.0 (EMUI 9.0.1), 8GB of RAM and 128GB of storage, while the display is a 6.4-inch 2,310 x 1,080 pixel LCD. A 3,750mAh battery boasts 18W fast charging, too. The so-called High model with 48 megapixel camera is priced at 3,400 CNY (£391, $493 USD).